Linvilla Orchard’s Apple Festival and Pie Eating Contest is Saturday, September 25th and Sunday, September 26th from 9am to 6pm. Media’s Linvilla Orchards is a Delaware County family fall tradition. You can be sure Linvilla’s calendar is filled with plenty of events to keep you busy when there’s a chill in the air and leaves crunching under your feet. AML has the full itinerary here—from a 40 foot scarecrow to a giant cornfield maze. At Linvilla Orchards Pumpkinland there’s everything you need to get into the fall spirit. Don’t miss Autumn Moon hayrides, pie eating contests, and live music. Kids will love the Jack-o-lantern exhibit, face painting, and stories about local lore. Dates: Saturday September 25th and Sunday September 26th, 9am-6pm. This weekend Linvilla gets into the full, fall festivities with their annual Apple Festival and Pie Eating Contest. What’s on the agenda? Plenty for the kiddos including hayrides, pony rides, face painting, children’s entertainment, costumed characters, games & contests, music, apple treats and recipes, candy apples, Pumpkinland and lunch at the Linvilla Grill. Enter the Apple Pie Eating Contest for the chance to win the champion title and a prize! Three age brackets: 6-10, 11-16, & 17 and over. Pick-Your-Own crunchy, juicy apples right from the tree. Take home as many as you can carry to create some delicious apple treats like apple pie or candy apples. 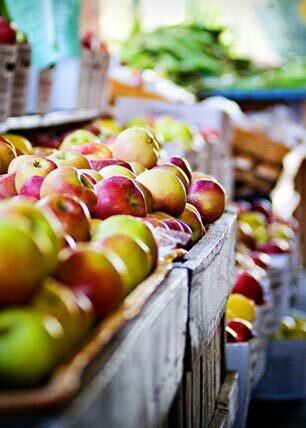 Visit the Farm Market to sample an incredible assortment of our own crisp, juicy apples. Pick up a world famous apple pie, fresh apple cider, or delicious apple butter. Chef Marc Vetri of Vetri, Osteria, and Amis Restaurants will be performing a cooking demonstration during the festival on Saturday, September 25th. Check it out and learn some simple, delicious recipes featuring our very own scrumptious apples! During the months of September and October, Pumpkinland takes center stage at Linvilla Orchards, a Delaware Valley family tradition. Larger than life figures and scarecrows illustrate the legends and lore of the harvest season, local history and some of the many stories of pumpkins and apples. See their piles of pumpkins in all shapes and sizes, straw bales, corn shocks, fall decorations of all kinds, masks, costumes and toys. Don’t get lost in a straw bale or cornfield maze! 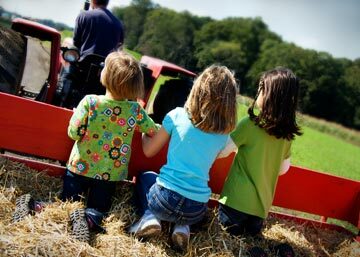 Take a hayride thru the fields and orchards; climb aboard a passenger train “The Playland Express;” experience a ride on a real pony; let “Face Painting by Stacey” transform you into a princess or Spiderman, visit with the farm animals, catch a big fish in Orchard Lake and play in the all new Playland Playground. Dates: October 1 thru 3, 8 thru10, and 15 thru 30. Hayrides run continuously throughout the night. Linvilla’s popular Harvest Hayrides in September are Saturday and Sundays from 10am to 5pm. Hayrides also run from October 1st through November 7th: Monday through Friday 12:30 to 4pm; Saturday and Sunday 10am to 5pm. Double, double toil and trouble; fire burn, and caldron bubble! Come to Linvilla Orchards and capture a little bit of magic and enjoy a Hayride to the Witches House. Great for children 11 and under and a very fun way to gather the family for a non-spooky jaunt through the woods. Forget scary witches, this one is all about fun; she’ll give everyone a treat, then regal them with jokes and stories. Marshmallows to roast around the campfire and a bit of Linvilla’s apple cider only sweeten the deal. While you’re in the spirit, drop by Pumpkinland and pick up festive decorations like hay bales, cornstalks, and pumpkins for carving. Then make your way to the Farm Market, since their fresh baked pies and other seasonal goodies aren’t to be missed. In fact, they may just put you under a spell. 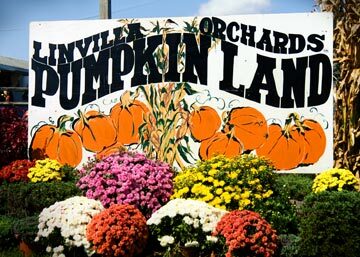 Linvilla Orchards is located at 37 W. Knowlton Road Media, PA 19063. Call 610- 610-876-7116 or visit www.linvilla.com for additional details.